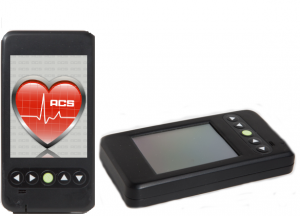 ACS Diagnostics has recently announced the release of their proprietary mobile cardiac telemetry (MCT) monitor called the CORE¹² (Cardiac Outpatient Real-time ECG). The CORE¹² is the first to have FDA approval as a multi-function cardiac monitor capable of performing a 12 Lead EKG, 24 – 14 day Holter monitoring (continuous ECG monitoring), cardiac event monitoring, mobile cardiac telemetry monitoring as well as 12 Lead ECG for Stress Testing. The ACS CORE¹² monitor is slightly different in configuration to other MCT devices as the CORE¹² is an integrated device with only one piece. The CORE¹² has approval on its ECG algorithm to detect abnormal ECG activity as well as a monitoring technician in the ACS Diagnostics laboratory monitoring every beat.